The Obsidian Series 650D is manufactured with strong, stamped steel parts for increased rigidity, and coated in a black textured paint. The front panel features a beautiful black brushed aluminum faceplate to bring a subtle elegance to your next build. A large, black 200mm intake fan hides behind the front dust filter, quietly pushing vast amounts of air over your hard drives and video cards. The air is then exhausted by a second 200mm fan on top of the case, and a rear 120mm fan. The top fan can be replaced by dual 120mm or 140mm fans, and is pre-spaced for a dual radiator if you're interested in watercooling. And all fans are controlled by a three-mode, four-channel fan controller should you want to make your own choice between noise and performance. The 650D is a member of the award-winning Obsidian Series of cases from Corsair. The Obsidian Series is more than just a name - it means real features that can benefit even the most experienced system builder. 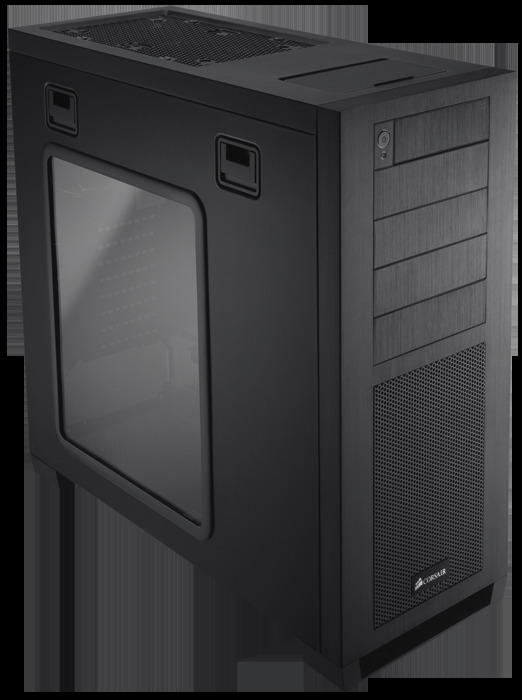 The Obsidian Series 800D and 700D full-tower cases share the same case dimensions, rock-solid construction, isolated cooling zones, and lots of other features that make them truly great cases for builders. Choose the Obsidian Series 800D if you'd like hot-swap SATA drive bays and the clear side panel strikes your fancy; if you don't need the hot-swap feature and you like the look of the solid side panel, the Obsidian Series 700D is for you. The 650D is a mid-tower variant for those that don't need the room of the 800D and 700D, but still want excellent cooling and elegant good looks in a compact package.